Caroline Wozniacki (born 11 July 1990) is a Danish professional tennis player. She is a former World No. 1 on the WTA Tour having held this position for 67 weeks. She was the first Scandinavian woman to hold the top ranking position and 20th overall. From her WTA debut in 2005, she improved her year-end ranking each year until finishing on top in both 2010 and 2011. 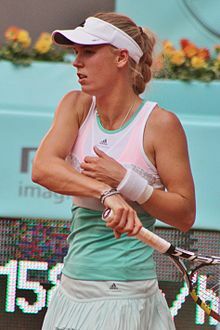 Wozniacki has won 22 WTA singles titles as of August 2014, three in 2008, three in 2009, six in 2010 (the most in a year by a WTA player from 2008-2011), six in 2011, two in 2012, one in 2013 and one in 2014. She was runner-up at the 2009 US Open and the 2010 WTA Tour Championships in Doha to Kim Clijsters. She won the 2006 Wimbledon Girls' Singles title but has yet to win a women's Grand Slam title. She also holds two WTA titles in doubles. View also other tennis players: Ana Ivanovic , Anna Kournikova , Maria Kirilenko , Maria Sharapova , Serena Williams , Venus Williams , Victoria Azarenka .